Day 3 of my birthday desert trip had Karl and I up fairly early at 6a, driving to Needles where we left my van and then southwest on Eagle Pass Rd heading into the Sacramento Mtns. 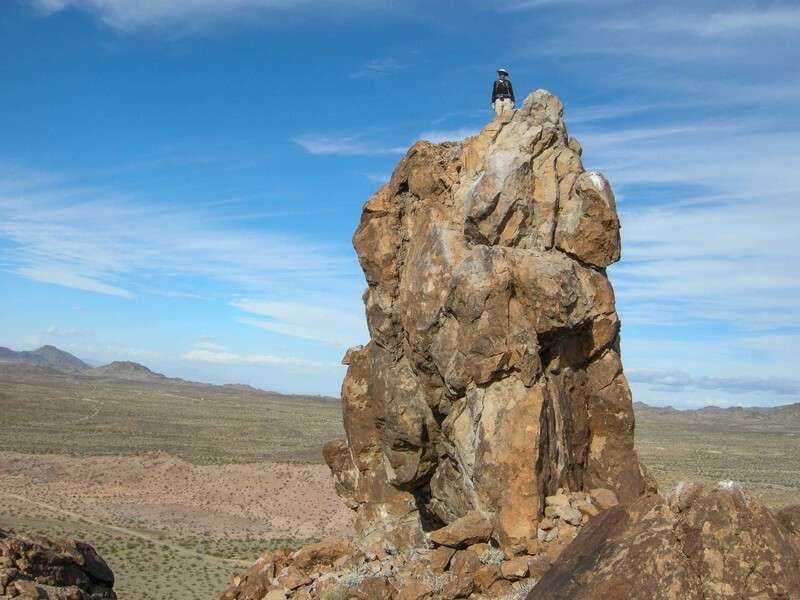 Eagle Peak is both a P1K and in Zdon's Desert Summits, giving me two reasons to go after it. I had hoped to do it on my last trip in the area but it isn't really suitable for those inconvenienced by low-clearance vehicles. Zdon and others describe the road to Eagle Pass from the west but that would have been well out of the way for us since we were heading south on US95 afterwards. Luckily Evan had been to Eagle Pass from the Needles side and gave us a good enough report to take Karl's Element on the journey. The road was decent enough but we managed only eight of the ten miles to the pass before running into an obstacle. Later observations suggested there was a better way around this section of the wash and we could probably have driven to the pass if we'd persevered. I didn't mind in the least, actually, because our starting point was ideally suited for a looping route I had in mind that would take in the nearby Nomento BM, a bonus peak with more than 800ft of prominence. Evan didn't join us on this morning effort because he'd already been to Eagle Mtn (thinking it the highpoint of the Sacramento Mtns, it turns out to be only the third highest). Instead, he would go birding along the Colorado River and join us at the base of Snaggletooth later. All the parties we read up on had climbed Eagle Peak directly from Eagle Pass. Though only 2/3mi, the route is steep and not very imaginative. We started by hiking about 1.3mi further up the wash/road before jumping on the East Ridge. A cliff band encircles much of the mountain about halfway up and there was some uncertainty as to whether we could find a way through it. The view we had from below in the wash suggested a possibility which turned out just fine - easy class 3 at the most. Above, the terrain becomes easier and by 8:20p we had made our way to the summit, taking barely an hour and a quarter. In addition to some fine views, we found a 1935 benchmark and a MacLeod/Register dating from 1984. Some 25 pages in all suggest the peak is fairly popular. The most recent entry was by Daryn Dodge back in February - I somewhat expected this, having seen his name on Bannock BM about 6mi to the northwest on my previous desert trip. After a short break, we turned our attention to the northeast in which direction lay Nomento BM. About 2.5mi distant, the hike between the two was not difficult but consumed the better part of two hours' time. There was no cliff band on this side of Eagle Peak to negotiate but there was plenty of cholla to keep us on our toes and going a little slower. We dropped more than 1,000ft to a saddle enroute before climbing 800ft to the second summit. Andy Smatko and party had left a note in 1983 with Gordon & Barbara visiting three years later. Unfortunately the pages of the register left by Gordon were extremely brittle and had mostly disintegrated inside the jar into unreadable tatters (perhaps the jar had been left for years exposed to direct sunlight? ), and I couldn't make out any of the names from the few other parties that had visited since. We descended south and then southeast along a series of ridgelines dropping us back to Eagle Pass Rd only a few hundred yards from where we'd left our vehicle. Our 11:30a return gave us a time of about 4.5hrs for the outing. We drove back to Needles, stopping for gas and fast food before heading south on US95. About 24mi to the south, the highway cuts through the northwest end of the Sawtooth Range. On the left (west) side of the road is an interesting set of crags, the highest of which is Snaggletooth on the topo map. Expecting to meet Evan here, we drove past for more than a mile before realizing the error. We had completely missed the unsigned turnoff with Evan's camper tucked neatly behind a low hill, almost invisibly. I had no beta whatsover about this peak other than it was named on the map and looked to be an extremely short hike. About ten minutes is all it would take, but it was easily the most interesting summit of the day due to its technical difficulties. Had I perused Purcell's 2nd edition of Rambles and Scrambles I would have known that he rates the South Arete/Face as class 4-5 and the easiest route to the summit. In this case it was probably better I didn't know. The three of us scrambled up from the north side to a saddle between the summit and its lower neighbor to the west, and from there climbed up easy ground to the start of the South Arete. It looked hard and terribly exposed. I continued spiraling around a convenient shelf to the east and then north side before finding something more to my liking. A class 4 crack with only moderate exposure took only a few minutes to negotiate and leading to the very top. I looked down at Evan still at the base of the South Arete but he had no interest in following me. Karl had already given up and started over to the lower western summit. Finding no register, I took a few photos before reversing my moves off the summit. I went over to examine the west summit that Karl had already retreated from, but found it harder than the route I'd done on Snaggletooth. Karl and I both had examined the east side but not other possible routes. I didn't have a whole lot of interest in pursuing it, so we all returned to the vehicles. This tiny range sits in front of the much more impressive Chemehuevi Mountains that overshadow it. Much of the range is made of poorly consolidated granitic rock that looks much better from a distance than up close and personal. Evan had been to the range in 2009 as part of his quest to tag all the CA range highpoints but decided to join us anyway since Snaggletooth hadn't quite been the exercise he was hoping for. We parked about a mile from the highway down a good dirt/sand powerline road, almost as described in Zdon's guidebook. We hiked over easy ground for about a mile and a half to reach the base of the mountain. We didn't realize it beforehand, but there are two closely spaced summits several hundred feet apart, each with the same number of contours on the topo map. Our GPS led us to the top of the south summit which LoJ and Peakbagger both have as the range highpoint. Though somewhat steep in places, the climb was no more than class 2, taking about 45min from the start. John Vitz left a register here in 1998 which was subsequently visited by about half a dozen parties, including Evan. Looking northwest, one can't help but notice the north summit which appears to be of similar height, possibly higher. Evan hadn't even noted this other summit in his write-up after his 2009 visit. With clouds gathering and a few sporadic drops already falling, the others did not really want to visit the other point. I had no qualms - "Look, it's right there!" I admonished and went off in that direction. The others both followed shortly behind. More interesting was the register found here left by Gordon/Barbara in 1993, proclaiming it the range highpoint but without anything really to back up that claim. Others had varying opinions, but the most convincing was Richard Carey's entry in 2004 where he used a hand level to measure the north summit about 4 feet higher. If true, both LoJ and Peakbagger.com need updating. I pointed out to Evan that it was good he joined us AND came over to the north summit, since it looked like he hadn't reached the true highpoint on his earlier visit. Had he not done both of those things I would undoubtedly have given him a hard time shortly after returning. This wasn't the first time he'd had to go back a second time to the range because he'd misjudged its highpoint. We descended back to the desert floor and our waiting vehicle around 4p, not long before the rains would hit.